How much is too much - water, that is? Some experts say that you should drink to sate your thirst, while others suggest going with the classic "eight glasses per day" rule. And forget about what you should take on a hike - everyone seems to have a different opinion. Most people can, however, agree upon one thing - that people need water to survive and their needs change when involved in strenuous activity. This means hikers need to properly monitor their water intake. 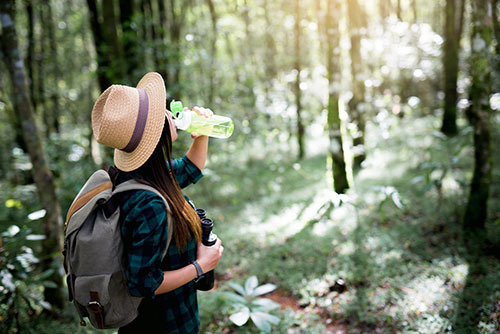 The North Country Trail Association advised that hikers attend to their hydration levels, looking out for dark-colored urine, dizziness or weakness. These are symptoms of dehydration. To avoid this, hikers should avoid alcoholic drinks or caffeinated beverages, and also try to drink beyond what they feel is their thirst level - to ensure that the body is receiving enough fluids. Carry a good-sized water bottle and remember water purification tablets if in remote areas or on longer, multi-day hikes. In addition, always keep track of how long you have hiked and how much daylight you have left using your WSD-F20. Drinking too much water can be just as detrimental as failing to rehydrate. The body's delicate electrolyte and sodium balance can become disrupted, potentially leading to other complications. The Denver Post suggested that hikers only increase their water intake in a moderate fashion, and that they remember to consume salt. Trail mix or an electrolyte solution are recommended by one expert quoted by the source, who also wants hikers to understand the signs of low blood sodium, which can be confused with altitude sickness - something of which those who choose hikes at higher elevations should be aware. People who seem confused, are stumbling around more than usual, and who may experience a seizure can be suffering from consuming too much water, according to the source. One way to keep water with you is to invest in a hydration pack, REI advised. A hydration pack is designed for those who don't want to stop and pull out a water bottle; the user can sip on the go. There are two kinds of wearable hydration packs, according to REI. Hikers can choose from a hydration backpack, or a hydration waist pack. An internal bladder, or reservoir, holds water. Hikers should choose the right kind of pack for their intended activity level; some are higher capacity, others are more suited to more intense forms of exercise, such as running. Hydration on the trail is key to a great hike. As with many other aspects of hiking and outdoor activity, finding a balance is important. Listen to your body, and pack recommended items like hydration tablets and a good water bottle or hydration pack and when in doubt, ask your doctor for advice.